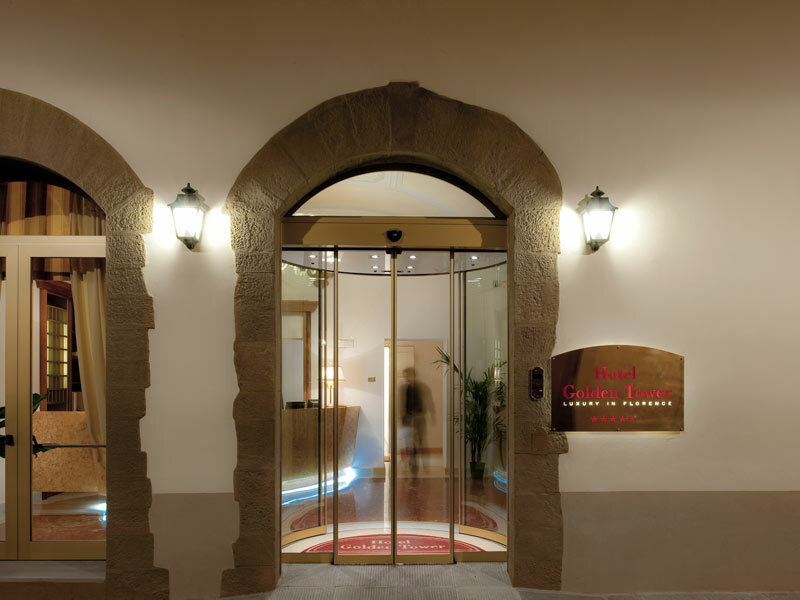 Tucked away just off of one of the busiest places in all of Florence, this luxury boutique hotel quite literally combine’s the city’s past with the most modern accommodations travelers require today. Housed in the original home of the Vecchietti family, this hotel lavishes in its history, original stone details, and prime location. Designed by Giambologna in 1578, Palazzo Vecchietti is the quintessential Tuscan building: yellow stucco interior, oversized walls, brown shutters, elaborate stone cornices. Look up and you will see the original Vecchietti family coat of arms. Inside this boutique hotel, you’ll be awestruck by towering ceilings, original brickwork and fireplaces, and the very old Bizantina Tower. The 12 guest rooms and suites are outfitted in elegant, classic styles that would make the fur trading family that once called this place home proud. The six deluxe rooms, each named after a famous Florentine, are regal—from the luxurious drapes and tapestry to the velvet couch, mirrored doors and Renaissance-inspired artwork. A large wardrobe, an in-room library, and a large bathroom with a rain shower mean you will be comfortable and stylish. Some rooms even feature a kitchenette. Accommodating up to four guests, this bi-level suite is flooded with sunshine and complimented with warm earth tones. 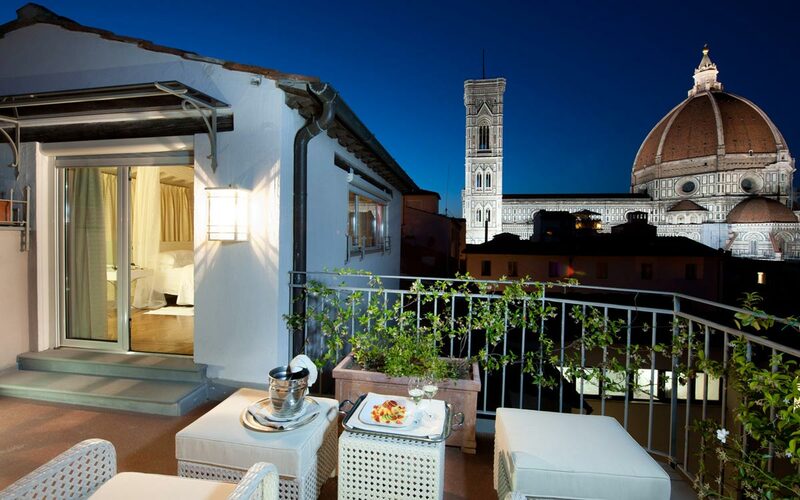 Relax to the max with an in-room kitchen, multiple seating areas, and a private terrace overlooking all of Florence. Groups will also benefit from multiple bathrooms—one of which features a Turkish bath. Feel right at home in the Roof Deluxe room—well, maybe a bit more fancy. This bi-level room features a queen-sized bed with scented sheets, a large sofa, a kitchenette, and a large marble bathroom. Head up a twisting staircase to reach your private terrace, which is outfitted with lemon trees and a bistro set to sit a while and enjoy the beauty around you. 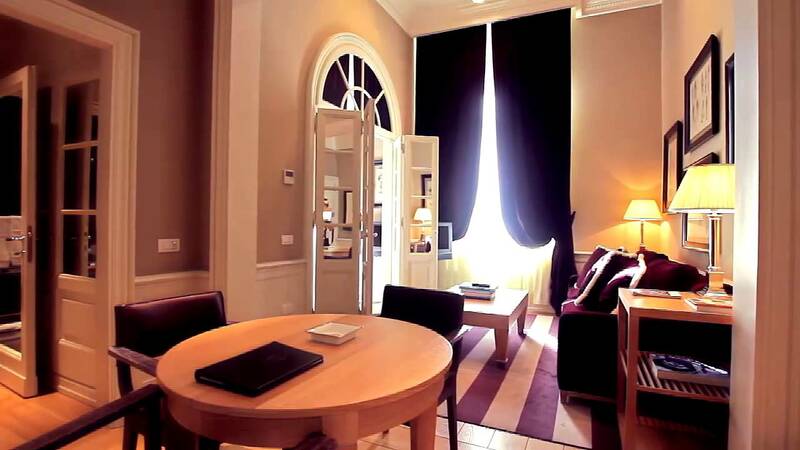 Stay in the best rooms in the house—deemed such by the original family who chose them for their own private quarters Oversized windows, majestic purple velvet, oversized chairs to lounge in, and a kitchen with Portuguese stone—these are some of the amenities that make the Suites at Palazzo Vecchietti unforgettable. The floor-to-ceiling drapes compliment the plush couches and striped rugs. High ceilings, a marble bathroom, and arched mirrored doorways add an element of luxury you won’t find in many other places. Lavish in 100 square meters of refined taste, contemporary décor, and oversized mirrors that reflect the natural light pouring in from a skylight. Up to four quests can revel in this enormous space, which is full of lounges and fireplaces, a bedroom with a king-sized bed and private bathroom, plus a 32-square meter terrace overlooking the inner courtyard. The kitchen is outfitted with a refrigerator, a dishwasher, and a stove, plus all of the pots, pans, and dishware you’ll need to make this place your home for an extended stay. 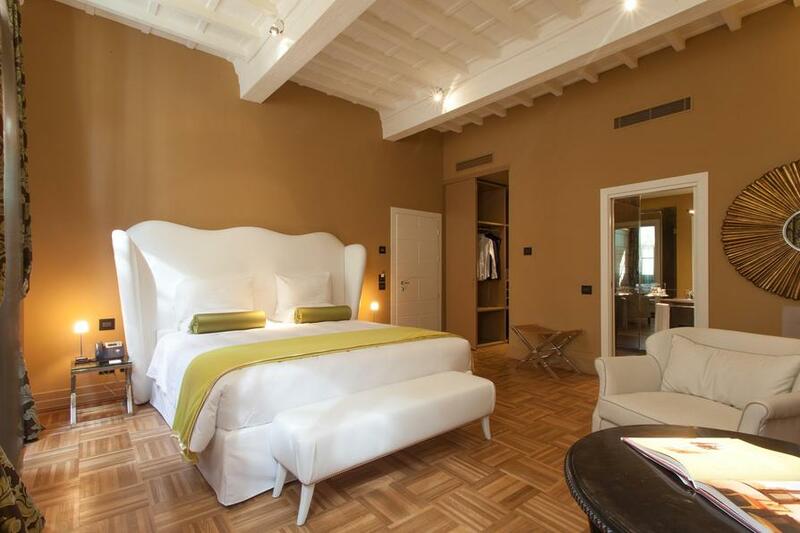 Though the namesake of this apartment is from Florence’s other famous family, the hotel pays tribute with a stunning 92-square meter apartment. Wood beams line the ceiling, and the living room features plenty of plush seating, plus a hidden kitchenette. It also has two bathrooms—one of which has a Turkish bath. Stay in the middle of all of the excitement of Florence. 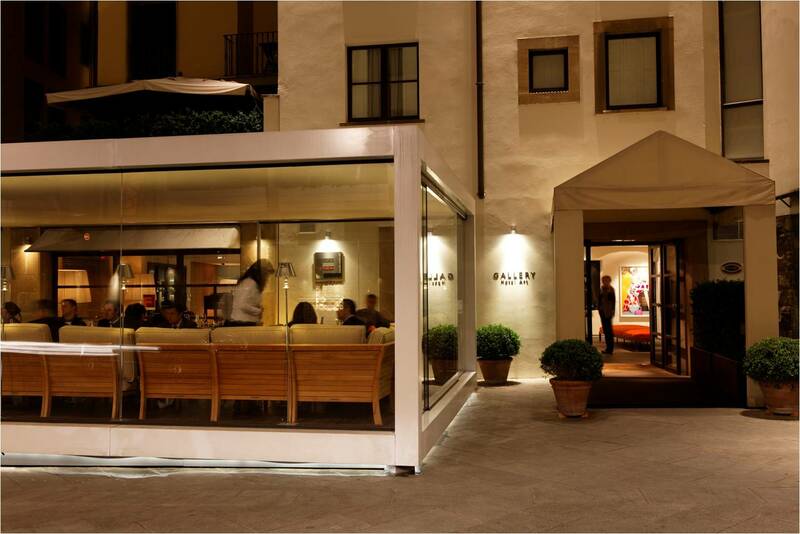 Located just steps from Piazza della Repubblica, you will also be minutes from the Duomo, Palazzo Vecchio, the Uffizi, and Ponte Vecchio. Shopping and fine dining surround you. If one of Florence’s most famous families chose this spot to build their home, you know it must be the best place to be in all of the Renaissance City. Children under 5-years old stay for free in beds or a crib; an older child or an additional adult charged additional fee. Pets allowed on request. Free of charge.